The origins and significance of the King’s Lynn May Garlands are lost in the mists of history. 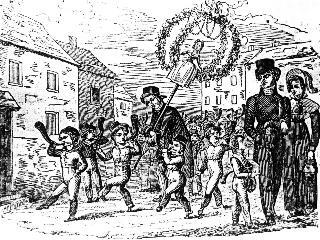 By the nineteenth century the May Day festivities in the town were being carried out by the children. The celebrations began at dawn, when they opened the doors of their houses in order to greet May Day, and then gathered flowers to make May Garlands. Mischevious children would nail up the door-latches of their friends houses, so that they would be unable to open their doors! The garlands consisted of two hoops of flowers and leaves, with a doll set in the centre, all mounted on a pole. Usually the garlands were further decorated with festoons of birds eggs and ribbons. 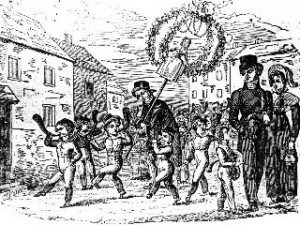 Throughout the day the garlands would be carried around the streets, each with a group of children blowing cows horns and collecting money from the public. At the end of May Day each garland would be suspended on a rope across a street, and the children would play hand-ball, attempting to throw the ball through the hoops of the garland or over the rope. The engraving shows the St James workhouse garland in the late 1820s; it was carried about until 1836. It was reckoned to be the largest of the town’s garlands. The horn blowers were pauper children. King’s Lynn Corporation officially banned May Garlands in 1835,for being a public nuisance. However, they were still carried around the town even as late as the 1930’s. But by that time the horn-blowing had disappeared, and the floral garlands were often replaced by a doll and some leaves in a box. Within living memory May the first was known as Garland Day in the North End (the old fishermen’s quarter of the town). The King’s Morris revived the tradition of the King’s Lynn May Garland in 1983. The garland is always presented on the true May Day, the first of May, not on the May bank holiday. The garland procession starts at twelve noon from the Saturday Market Place, and goes around the town for a couple of hours. There are also displays of morris dancing.